I have my wall hanger, dowel rod, and a plan. 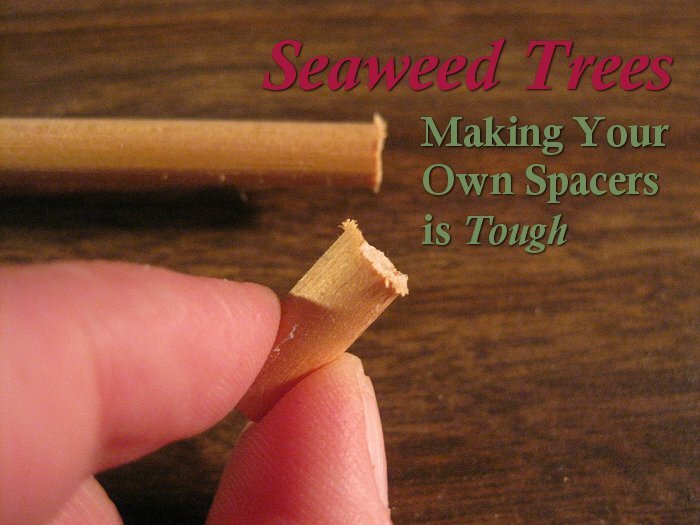 I’m all set to make my own spacers to mount both layers of the Seaweed Tree carving for max shadows. 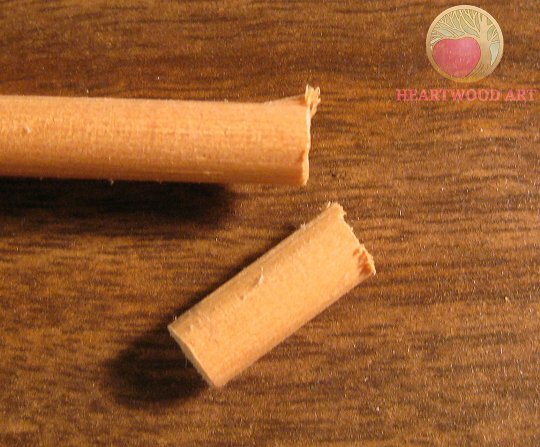 I discovered really fast just how hard it is to make wooden spacers from a dowel rod, and eventually ended up switching to plan B. Maybe this post will save you from the same trial and error, or maybe you can tell me a better way to do it. Or maybe misery loves company and you’ll tell me you’ve been down the same road too. This part of the project went according to plan, thankfully. I grabbed a scrap piece of the plywood for the carving. And I cheated a little to get the dimensions. Instead of measuring, I just stuck it under the side of the alder frame where it was going to be mounted, drew a line, nudged it in, and then drew the other line. I wanted it to be a little less wide than the frame, so it wouldn’t show. 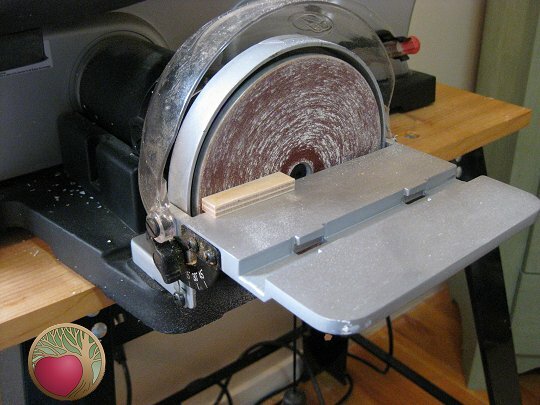 After cutting it out with the scroll saw, I used the handy, dandy sanding wheel on the side to smooth the edges a bit. I call this splinter sanding. It doesn’t have to be pretty, it just needs to not be rough. Holy cow! 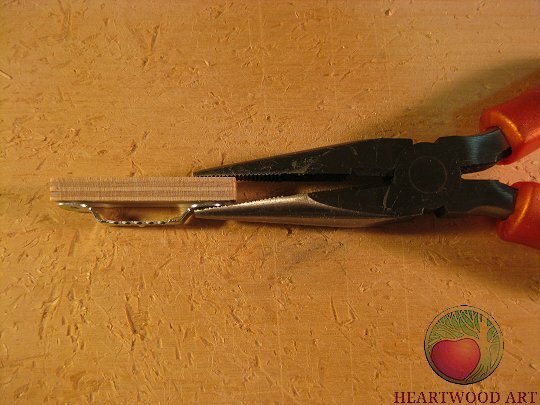 I hammered and then I hammered some more, until I could get the little tines of that hanger started into the wood. That’s some tough metal and a solid shape! I’m surprised I didn’t bend it. Once it was about half way in, I used pliers to mash it the rest of the way. In the previous post, I showed the Crazy Glue I thought I would need to keep this thing from backing out of the wood. Doubt I’ll need it. Nothing is getting that puppy out now!!! Good tools get the job done easier and faster. That’s what my dad taught me. I was honored to be given his tools back when he passed on. Still have them. Still use them. A few years ago, when I had the fanciful idea that I would be making my own frames and/or just needing more precise cutting, I got a good saw for it. 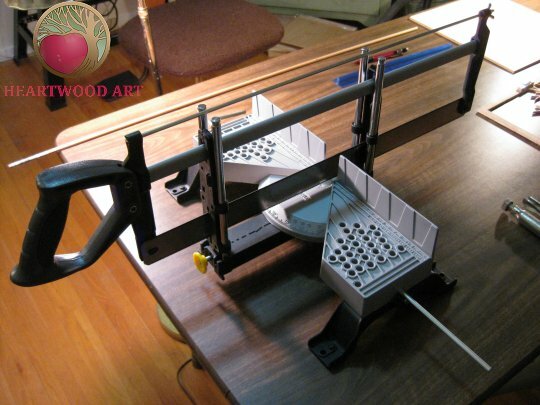 Thought that would be perfect for cutting the dowel rod. I tried hand sanding by laying the paper flat and lightly stroking the edge of the cut piece to basically splinter sand. Then tried to hold it square to the sanding wheel. Tried scoring it first. Nope. Cutting with sheers. Nope. Cutting with a utility knife. Nope. This is as close as I came. 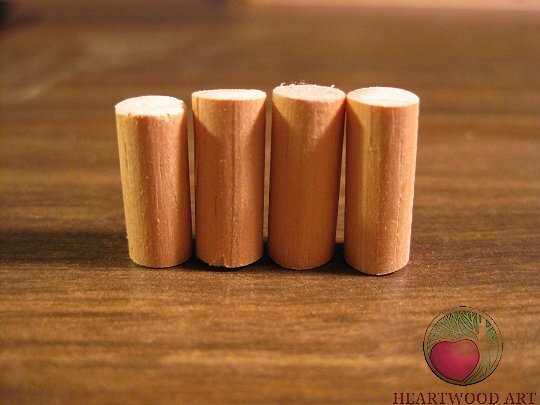 The only reason I tried to make dowel spacers is because one layer of scrap wood from the piece was too short and two pieces stacked was too tall. But then the light bulb went off! A little too tall is a good thing. I plopped a carving onto a really big spare piece of wood and measured the same way as I did for the hanger spacer so they would be a little shorter than the frame. Drew a straight line and cut it out on the scroll saw. Then I took a second measurement the same way, but in the other direction. Measured that. And repeated down the line to mark off 16 spacers. 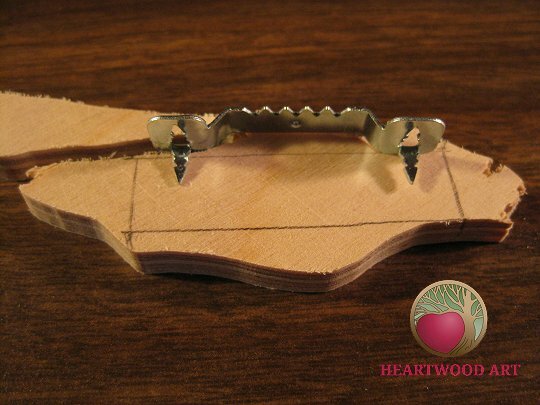 A splinter sanding pass or two on medium grit paper was all they needed to be smooth. I checked for fit. Got out my Gorilla Glue, and started stacking spacers. 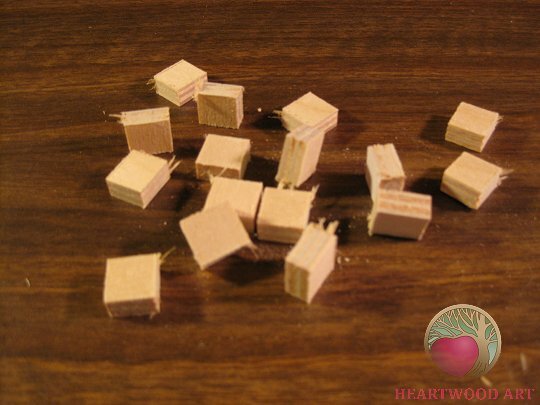 I placed them on both the front and back of the rear alder piece. In the next post, I’ll show you how well it all worked out. And, how gorgeous the wood became when all oiled up!